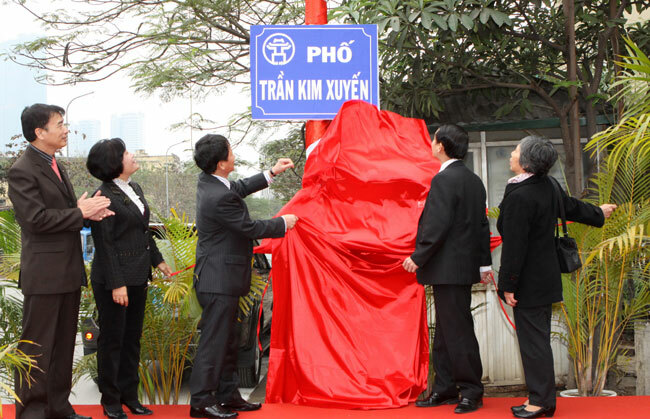 HA NOI (VNS) — A plaque unveiling ceremony for naming a street after Tran Kim Xuyen, Vietnam's first journalist- martyr and the Viet Nam News Agency's first director, took place in Ha Noi yesterday. Tran Kim Xuyen was a member of the revolutionary Vietnamese press who sacrificed his life. The Tran Kim Xuyen Street, 550m in length and 20m wide, is part of the new urban area in the Cau Giay district. Born in the Huong Son district in the central province of Ha Tinh, Xuyen was appointed as Deputy Director of the Ministry of Home Affairs' Viet Nam Information House after the 1945 August revolution. He was directly in charge of the Viet Nam Thong Tan Xa, now known as Thong Tan Xa Viet Nam (Vietnam News Agency). He was also a deputy of the first National Assembly. Tran Kim Xuyen laid down his life on March 3, 1947, at the age of 26, thus becoming the first revolutionary journalist to die in a battle. Speaking at the event, VNA Director General Nguyen Duc Loi paid tribute to Xuyen for serving the country and its press, especially the VNA.